In my posts on exercise, I have already briefly mentioned biking, but I felt that this topic deserved it's own post. 2. Some dogs, to their detriment, will keep going as long as the pet parent keeps going. 3. But what happens if the dog does try to stop? If the dog stops abruptly, even if the pet parent is paying close attention, the bike might move a few inches before coming to a stop. Which might mean injury to the dog. If the pet parent doesn't notice the dog stopping, the potential for injury goes up exponentially. 4. In addition to possible exhaustion, running too far too fast can result in joint injuries and worn foot pads. 5. What happens if the dog sees something interesting and tries to take off in a different direction? 6. What if brakes on the bike fail while the bike is moving? Or what happens if the chain comes off? 7. What happens if the dog unexpectedly runs in front of the bike? 8. Can humans pay close attention to the road, traffic, other animals, cars, pedestrians and their dog at the same time? 8. What happens if the pet parent hits a rock or some other obstacle? 9. It's going to be harder to deal with menacing off-leash dogs when the pet parent is on a bike. 10. Dogs can get frustrated (especially dogs who are already nervous, hyper or reactive) when they are forced to run past smells and sights without being able to check them out. 11. Too much exercise can be stress inducing. If you enjoy biking and want to spend time with your dog at the same time, consider using a secure, fully enclosed bike trailer. But still ride with caution and at safe speeds. And check on the dog often. Check with a professional on the safest way to use these. 1. Get a thorough checkup with a physical therapist vet or a sport vet first to make sure it is something your dog can handle. 4. Ride at a speed that allows the dog to walk or trot. Don't force the dog to gallop. 5. Consider a tricycle instead of a bicycle for greater control. A reccumbent tricycle might provide a lower center gravity and allows the human to be at the same level as the dog. 6. Take breaks and check in with your dog often. Stop and look at his feet for irritation or cuts. Notice how she moves when she gets up from a resting position. 7. Even if the dog is running with the bike, consider bringing a bike trailer along. If the dog gets tired or over stimulated, he can ride in the trailer. 8. Ride when temperatures are cool. 9. Bring plenty of water and offer it often. 10. Don't ride down steep hills. 12. 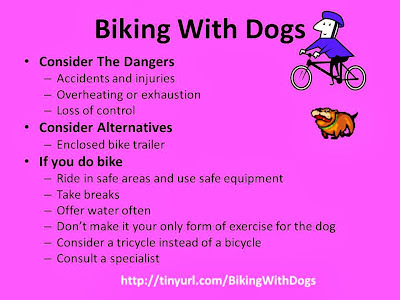 Do not use choke chains, prong collars, slip leads, nor retractable leads when biking with your dog. Face halters might also be a bad idea. Consult with a specialist on the safest equipment to use for biking. -The above information also applies to roller blades, skates, skate boards, or any wheeled apparatus or vehicle. -Never have a dog run alongside any motorized vehicle - motorcycles, cars, etc.. - the exception being slow moving, motorized assistance vehicles (pet parents should have a professional help with training and safety precautions). Pets should also be acclimated to the vehicles. 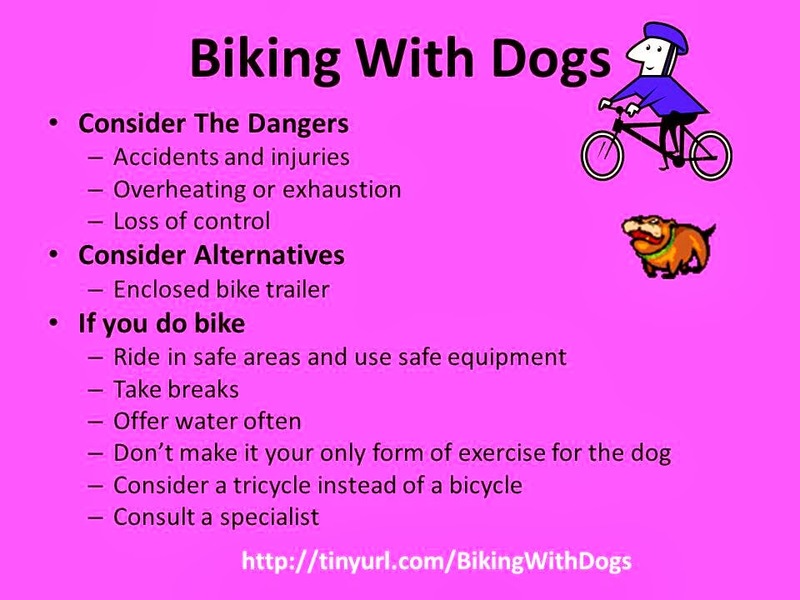 - If you decide to use a bike trailer - acclimate your dog to it before using. Once your dog is acclimated, then take several small trips to make sure it is working out for the dog. For information on crate acclimation, click here. The information can be extrapolated to bike trailers. A while back, I got new roller blades and wanted to try them out. I should have tried them before going with my dog. I fell, of course. He's resilient, so he would go again, but another dog could be scared forever. It wasn't a smart move for me - a bike, skates, etc. should always be "mastered" without the dog first, obviously. Thanks for sharing @Bad. An excellent example. I'm glad it worked out okay. And I'm really glad you didn't fall on your dog. Thanks for sharing your experience with recumbent trikes. They seem safer than bikes.